the ocean generally return in lower numbers as adults than fish that arrive earlier," Graves said. Below-average runoff in May has triggered dry-year operations in the Columbia River Basin, putting in place a strategy to boost river flows to assist migration of juvenile and adult fish, including listed species. The Northwest Power and Conservation Council, meeting in Coeur d'Alene, Idaho, was briefed on the strategy June 10 by representatives of BPA, the U.S. Army Corps of Engineers, Bureau of Reclamation and NOAA Fisheries. 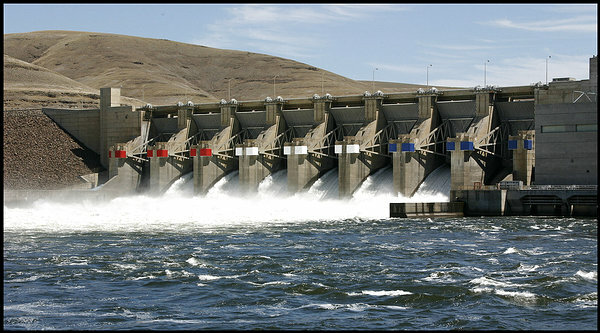 The Federal Columbia River Power System BiOp calls for dry-year operations when NOAA's Northwest River Forecast Center predicts in May that the April-August runoff volume will be less than 72.2 MAF for the Columbia River at The Dalles, or less than 82 percent of average. The final May forecast, released May 7, was for only 62.4 MAF, or 71 percent of average, and nearly 10 MAF less than the trigger. When dry-year operations are triggered, federal storage reservoirs are drawn down farther than normal to provide more water for fish. The usual practice in this case, the Council was told, is to shift as much water as possible into the spring migration, even though this will likely increase the risk of having less stored water for temperature control and refilling reservoirs in the summer. For the coming spring and summer months, some 8 MAF of flow augmentation will be mustered to help migration. More than half of it will come from reservoirs in British Columbia under the Columbia River Treaty and the Non-Treaty Storage Agreement, said Tony Norris, BPA operations research analyst. The additional water provided this year is resulting in average or near-average travel times downriver for juvenile salmon and steelhead, said Ritchie Graves of NOAA Fisheries. While the flows so far are below BiOp objectives, Graves said, "that is expected in a dry year." In fact, he added, they are extremely low-51st out of the 55 lowest-flow years on record. "The bottom line for us is that we care about migration timing because fish that arrive later to the ocean generally return in lower numbers as adults than fish that arrive earlier," Graves said. "We're eager to see how fish respond to the hydro system conditions this year." Recent low-flow years include 2001, 2007 and 2010, Graves said, although 2007 and 2010 are better surrogates for what to expect this year than is 2001, which was a "horrible" year for fish, he noted. Steve Barton, chief of the Columbia Basin Water Management Division of the U.S. Army Corps of Engineers, said while the low water is not causing navigation problems, it will be "a bit challenging" to meet the many requirements for special flows and river operations through the summer. Henry Lorenzen, an Oregon Council member, asked Graves how much fish transport could be expected this year. Graves noted that "there's a little bit of irony here," because in dry-year operations, with lower spill, "we actually transport fewer ... because the fish are moving over spillway and downstream." Pressing Graves, Lorenzen asked how that squared with the BiOp, which requires transport in years of high temperature. "But you're saying that because of low spill, you can't transport large numbers." Graves said, yes, under adaptive management, that approach is consistent with both the BiOp and the Independent Scientific Advisory Board's advice to spread the risk. "But I understand well why folks are a little jittery about this," Graves added. Council Chair Phil Rockefeller, representing Washington state, acknowledged that the system seemed to be showing "good resilience" this year, but asked, "What happens if this drags out?" If the current dryness continues into 2016 or later, Barton replied, "I'm confident we could handle it."